The highest peak east of the Black Hills of South Dakota. Located on NC 128 off the Blue Ridge Parkway in the Black Mountains (milepost 355). Measured in 1835 by Elisha Mitchell, a scientist, professor, and minister who destroyed the long-held assumption that New Hampshire’s Mt. Washington was highest. Heavily logged in the 1910s. Though replanted, its high-elevation forests are now plagued by the balsam woolly adelgid, acid deposition, and low-level ozone (increasing the natural stress of harsh winter weather). Located a mile from Mt. Mitchell on the panoramic Black Mountain Crest Trail, one of the roughest in the state. The rocky, rooty 12-mile path crosses 10 peaks of 6,000-plus feet before descending into Bowlens Creek near Burnsville. Honors Governor Locke Craig, who helped form Mt. Mitchell State Park in 1915. Destructive logging drove him to declare, “It was on a place like [Mt. Mitchell] that Moses communed with God. . . He has given this sacred place to us, and we should do our best to preserve it.” A special commission secured 500 acres for North Carolina’s first state park the following year. Formerly one of the “Black Brothers”—two adjacent peaks clothed in dark spruce and fir. The shorter brother now honors legendary tracker and bear hunter “Big Tom” Wilson. 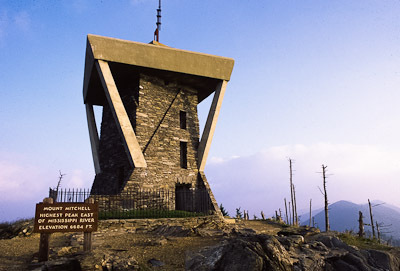 The highest point in the Great Smokies and on the Appalachian Trail. Located on the North Carolina/Tennessee border off US 441 in Great Smoky Mountains National Park. An easy ½-mile trail leads to a spiral concrete observation deck on the summit. Possibly the second-highest peak in the East, if not Mt. Craig. Craig was satellite-surveyed to an accuracy of 4 inches in 1993; Clingman’s Dome was surveyed conventionally in the ‘20s. Craig’s four-foot superiority is questionable until Clingman’s Dome is remeasured (not a state project in the foreseeable future). Named for Congressman Thomas Clingman, who questioned Elisha Mitchell’s extraordinary claims after making his own Black Mountain measurements. 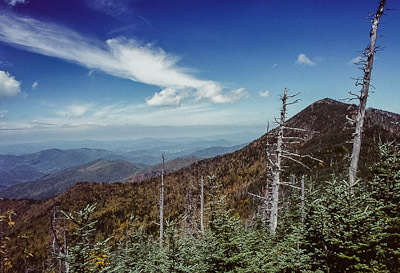 Clingman believed Mitchell never reached the high peak, but Mitchell’s proponents proved otherwise after the professor died on a waterfall defending his work. 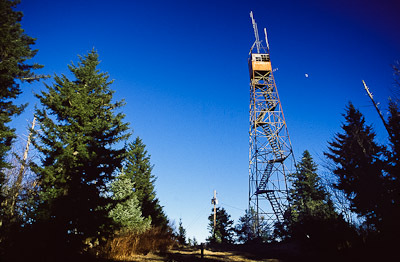 Sometimes confused with Clingman’s Peak, a 6,560’ peak topped with radio towers in the Black Mountains. Located at the junction of the Great Balsam and Plott Balsam mountains at Parkway milepost 451. 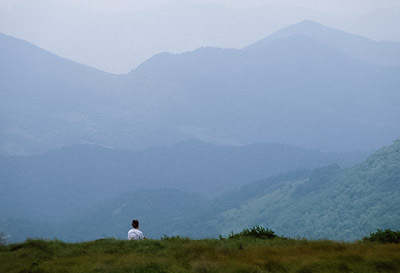 Offers 360° views of the Great Smoky, Cowee, Nantahala, Newfound, Black, and Craggy Mountains. Reached by a ½-mile trail, the highest on Parkway property. Located in the Great Balsam Mountains near the highest point on the Parkway roadway (6,053’ at milepost 431.5). Reached by a 1.5-mile loop in an aromatic Canadian forest. Red spruce and Fraser fir migrated south when Pleistocene glaciers were pushing boreal forest into Kansas and tundra into Kentucky; when climates warmed, southern ecosystems returned everywhere except high, cold islands like Richland Balsam. Located off NC 261 at Carver’s Gap. Comprised of two main summits on the North Carolina/Tennessee border. A wooden observation deck on Roan High Bluff (6,267’) looks out on the Bald and Unaka Mountains while a two-story cabin on Roan High Knob (6,285’) shelters Appalachian Trail hikers in a lush fir forest. Boasts 600 acres of natural Catawba rhododendron gardens blooming every June. 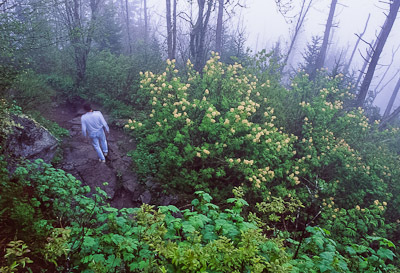 The annual Rhododendron Festival celebrates one of the largest displays in the world, accessible by short interconnecting trails. Located off US 221 near Parkway milepost 318. The highest point in the Blue Ridge Mountains. 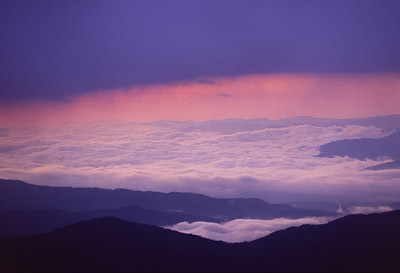 Geographically, the Blue Ridge Mountain Range is separate from other cross ranges (the Blacks, Smokies, Plott Balsams, etc.). On the other hand, geologists consider everything part of the Blue Ridge physiographic province (which would make Mount Mitchell the highest in the “Blue Ridge”). Contains metamorphic sandstone, making it geologically unique from the primarily gneiss mountains nearby. Its main ridge resembles an old man’s profile from certain angles. Privately owned and developed. A small fee accesses hiking trails, a nature center, designated wildlife habitats, and a famous “mile-high” swinging bridge. Hosts the Highland Games and Gathering of Scottish Clans, a day-long “Singing on the Mountain” gospel concert, and two photography events every year. Located in the quiet northeastern corner of Great Smoky Mountains National Park. Long trails leave Big Creek and Cataloochee Valley to ascend through increasingly northern forest communities en route to the evergreen summit. A shorter 3-mile trail leaves from old NC 284 at Mount Sterling Gap. Topped by a 60-foot Civilian Conservation Corps fire tower with views of Clingman’s Dome, Mount Pisgah, Mount Cammerer, Mount Guyot, Max Patch, and Cataloochee. Used to graze cattle around 1820, after previous settlers discovered Native American campsites in a clearing. Mt. Sterling Gap was one of the most famous in the Smokies thanks to the presence of migrating buffalo, traveling Indians, cattle drovers, Civil War troops, and famous circuit-riding Methodist minister Francis Asbury. Located at Parkway milepost 407 in the Pisgah Mountains. Allegedly named for its Biblical counterpart by Reverend James Hall in 1776. After leading Israel from Egypt, Moses had seen the Promised Land from a point named Pisgah on Mount Nebo (3,640’) in the Abarim range of Moab. Features a campground, picnic area, and rooms and meals at the privately-leased Pisgah Inn. 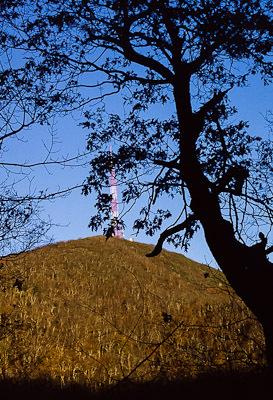 A 1.3-mile trail leads to an observation platform on the summit—which is also capped by WLOS’s enormous transmitting tower. 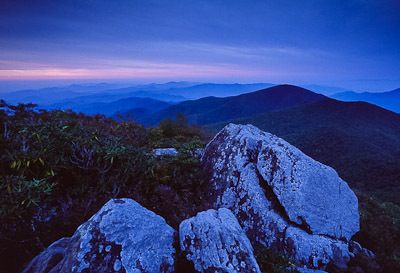 Sometimes considered the second-highest peak in the Blue Ridge Mountains. Technically, Grandfather Mountain consists of several summits, with Calloway Peak, Attic Window Peak, and MacRae Peak all coming in higher than the Pinnacle. Offers 360° views from its summit boulders. 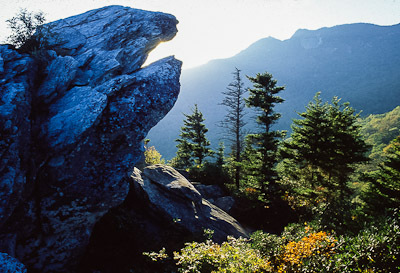 To the northwest is the southern arc of the Black Mountain Range; northeast are distant views of Grandfather Mountain and the Linville Gorge Wilderness. The Burnett reservoir (Asheville’s water supply) lies southwest, and Heartbreak Ridge tapers southeast into the Grandfather District of Pisgah National Forest near Old Fort. Located near Parkway milepost 354. 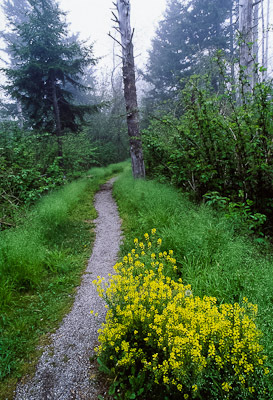 An old trail leaves a gated gravel road to reach the top in less than a mile.